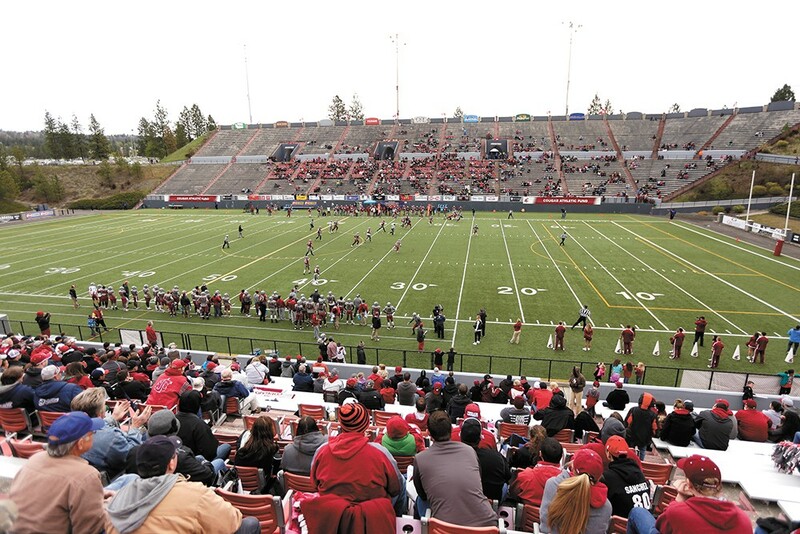 Joe Albi Stadium, pictured in 2015. In the basement of Spokane City Hall last week, with the deadline to make a decision fast approaching, Rick Romero faced the City Council with one final offer. This, he thought, could save the prospect of a new stadium downtown. The pitch to the council was simple: Let voters decide where they want a new stadium to replace Joe Albi Stadium. This time, the question would have no money attached. "I feel strongly that the decision we're making here is one that we're going to live with for the next 50 or 60 years," says Romero, who does strategic planning for the city. On Monday, the City Council took him up on the offer of letting voters make that decision. In a 5-1 vote, the council decided to put the question on the November ballot. 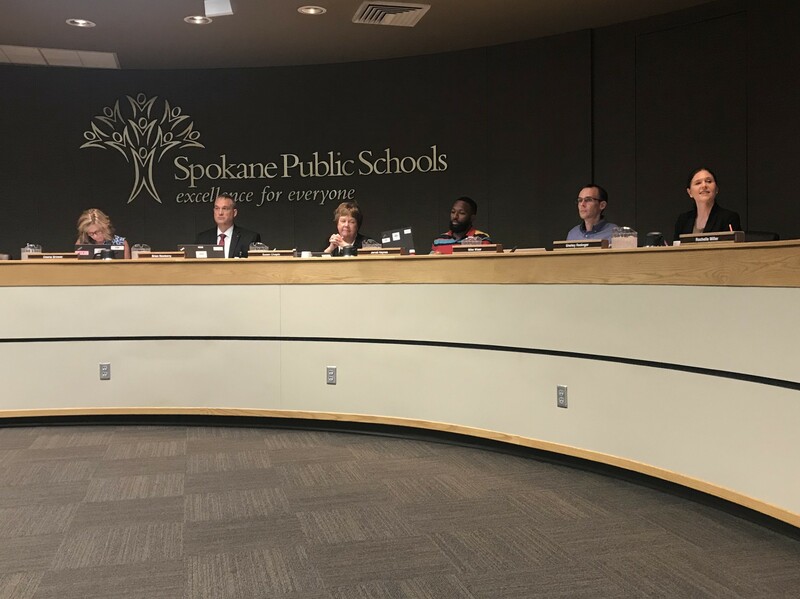 It's the final piece of an unprecedented partnership between the city and Spokane Public Schools. The two entities have been working together since late last year on a joint bond request involving several land swaps to save money on new middle schools and libraries. The city and district officially got "married," Romero says, in a joint meeting where the council and school board together approved bond requests of nearly $600 million that will go to voters in the November election. The school bond includes a request to replace Joe Albi, but doesn't specify where. The district had planned to build it where Albi currently resides in northwest Spokane until the city had the idea to construct it downtown. Thus far, the debate over a possible downtown stadium has cast a huge shadow over the new schools and the libraries, with neither the school board nor the City Council willing to take on the extra cost of building a stadium downtown. And not even a week before the filing deadline to put it on the November ballot, the downtown stadium proposal looked dead. The idea for a downtown stadium was never supposed to be decided by the City Council. It was supposed to be on the Spokane Public Schools side of the ballot. Yet for Spokane Public Schools, the easiest option was always to rebuild Joe Albi stadium where it currently sits in northwest Spokane. "Our plan when we started the partnership was to build the stadium at Albi," says Mark Anderson, associate superintendent of Spokane Public Schools. Spokane Public Schools knew it needed to replace Albi. It's oversized, with 30,000 seats making it feel empty during events that rarely see more than 1,500 attendees. The parking lot is dark, and the large space creates challenges with supervising high school kids. The concession roof is failing. The scoreboard needs to be replaced. Importantly, the district also needs new middle schools. To ease overcrowding in elementary schools, the district recently decided to move the sixth grade out of the elementary level and into middle schools. That creates a grade sixth-through-eighth model common at middle schools around the state. The simplest solution? Demolish Albi, rebuild it smaller at its current site, then build a middle school in the leftover space. It was the city that first had the idea to put the stadium downtown, Romero says. In fall 2017, the city already knew there was a good chance that a sportsplex would be built downtown by the Spokane Arena, Romero says. Adding a "third leg" to the north bank was an idea Mayor David Condon was behind, Romero says. For Anderson and the district, it was an intoxicating idea. Located downtown, the stadium would be more centrally located for area high schools. It provides more of an opportunity for other uses besides football for the city and the sports commission. And it would allow the city to expand Dwight Merkel Sports Complex, near the current Albi site, while the district could still build a new middle school there. The new stadium, too, could potentially bring in a minor league soccer team, Condon has said. The Spokane Public Schools Board of Directors and superintendent Shelley Redinger (right). The school board was cautious. Board members wanted assurances that a downtown stadium wouldn't bottle traffic and take away parking in the area. But a parking study and a traffic study commissioned by the district satisfied those concerns. And an analysis showed that building a new downtown stadium would cost roughly the same as demolishing and rebuilding Albi. However, the proposal presented to the school board also included a new parking garage by the stadium. And that would cost $10 million, an added cost of building a stadium downtown instead of where Albi is now. The district couldn't stomach asking school bond voters to spend extra money for a parking garage, says school board President Sue Chapin. The downtown stadium — just a tiny part of a $495 million bond request for new schools — could have taken down the entire bond. It's a risk the school board wouldn't take. In a July meeting, the school board decided to put the cost of a garage on the city's side of a joint bond request. It effectively separated the downtown stadium idea from the rest of the bond package. "The school board is fine with the stadium in either location," Chapin says. "As long as it's doing what the public wants." Sure, the school board said. If the public supports a downtown stadium, then go for it. But the Spokane City Council would have to be the ones to ask voters to approve the extra costs for parking. In meetings last week, council members said it put them in an awkward position. Until that point, the City Council had not been involved in the stadium project at all. Now, Councilwoman Karen Stratton said, "we're the bad guys." Five days before the deadline to put the advisory vote on the ballot, Romero thought the stadium advisory vote may not have enough support. That, he thought, would have been "a big mistake." They were on the 5-yard line, he says, but couldn't break through to the end zone. Romero, Anderson and Stephanie Curran, who heads the Spokane Public Facilities District, presented the City Council with an option to send an advisory vote on the ballot, one that had no money attached to it. That $10 million the school board was worried about? Romero told City Council that could be figured out later. 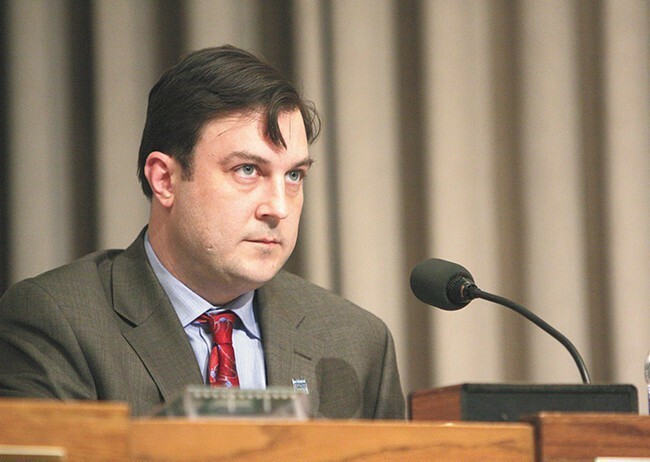 City Council President Ben Stuckart didn't want public dollars going toward a parking garage. In the days before council was to vote whether to put out an advisory vote, even he didn't know what he was going to do. He struggled with the fact that the council was being asked to send an advisory vote for a new stadium when the school district's bond contained the money to pay for it. He was uncomfortable with private interests like hotel owners trying to influence a public decision. And he was frustrated that nobody in the city consulted the council on the downtown stadium before tossing the decision to them in the last couple of weeks. "The council is the one that decides," Stuckart says. "Why is the mayor just assuming we're gonna be OK with that?" On Monday, council members still seemed perplexed as to why they, and not the school board, had to be the ones voting to put an advisory vote on the ballot. "This is not our issue. This is a school board issue," says Councilwoman Kate Burke. Burke, however, ended up as the lone "no" vote on Monday. She adamantly opposes any public money going toward a parking garage, even if no money is attached to the advisory vote on the ballot. While Romero, Anderson and Curran all say they can figure out the parking without going to voters with a $10 million request, nobody is clear yet on what that looks like. "What's confusing is people don't understand what they're choosing," Burke says. But Stuckart voted "yes," while vowing to fight against any public dollars going to a parking garage or anything different. Ultimately, Stuckart supported the advisory vote because he says he wants the conversation to get back to investments in schools and libraries. In his mind, the public focusing on the stadium instead of the other positive aspects of the partnership was the "worst case scenario" coming to fruition. Letting the voters decide means he doesn't have to talk about the stadium anymore. The original print version of this article was headlined "Leaving It on the Field"